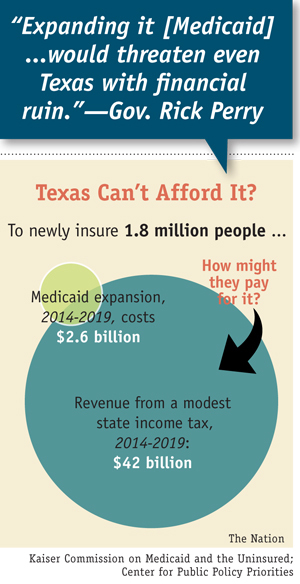 Texas has the highest rate of uninsured residents in the country (25 percent), and it stands to enroll some 1.8 million new Medicaid recipients through the expansion. These are some of the poorest people in America, making less than 133 percent of the federal poverty level (just $31,000 a year for a family of four). 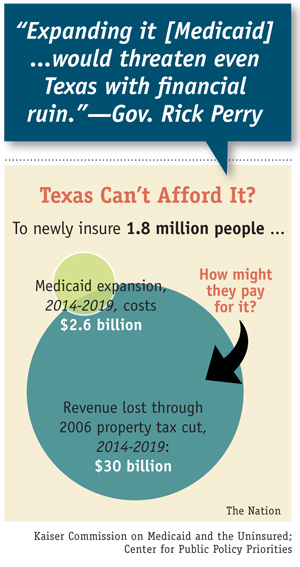 In the first six years of the expansion, from 2014 to 2019, the total cost of insuring these Texans would be about $55 billion—not an inconsiderable sum. But the federal government would pay more than 95 percent of that amount; Texas’s share would be just $2.6 billion. That’s not chump change—but threaten Texas with financial ruin? Not by a long shot. Rick Perry is not alone. Ever since the Supreme Court allowed states to opt out of the law’s expansion of Medicaid without forfeiting all their Medicaid funding, at least five other Republican governors—led by Tea Party darlings like South Carolina’s Nikki Haley, Florida’s Rick Scott and Louisiana’s Bobby Jindal—have summarily refused to implement the expansion on the grounds that their states just can’t afford it. They’re as wrong as Rick Perry. The federal government covers 100 percent of the expansion in 2014 through 2016. In 2017, states begin sharing the cost, paying 5 percent; that share grows to 10 percent in 2020. States are never on the hook for more than 10 percent of the annual cost. To put that in perspective, states currently pay between 25 to 50 percent of current Medicaid’s costs. 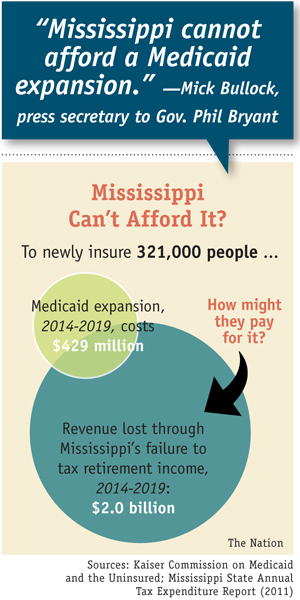 In many cases, Republican governors have wildly exaggerated what Medicaid expansion would actually cost their state. For example, South Carolina’s Nikki Haley wrote in an op-ed that the “price tag to South Carolina tax payers” would be “an extra $1.1 to $2.3 billion” over the next six years. 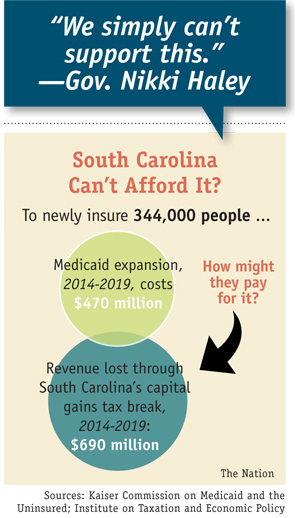 In fact, the Kaiser Commission on Medicaid Expansion and the Uninsured calculated that South Carolina would have to kick in between $470 million and $615 million, depending on how many people chose to enroll. Again, in the first six years of the expansion, the federal government would pay for more than 95 percent of the total costs, between $11.4 and $12.7 billion depending on the participation rate. South Carolina is also one of eight states that offers a substantial capital gains tax break, a policy that overwhelmingly benefits the wealthiest 20 percent. Since 1991, the state has allowed residents to deduct 44 percent of their long-term capital gains income from their taxes. According to the Institute on Taxation and Economic Policy, in 2010, this tax break cost South Carolina about $115 million in revenue. If they were to raise only that amount annually during the first six years of the expansion by getting rid of the capital gains tax break, they’d raise $690 million—which would more than pay for the Medicaid expansion. Let’s take a look at another regressive state tax policy. In Iowa, Republican governor Terry Branstad has claimed that the Medicaid expansion is “unaffordable, unsustainable.” But Iowa is one of three states that allow taxpayers to deduct 100 percent of their federal income tax payments from their state taxes. As the ITEP points out in its report, this unusual tax break undermines the progressivity of federal tax policy and overwhelmingly benefits the top 20 percent, who enjoy between 76 and 83 percent of the cuts. In 2011, Iowa lost about $642 million in potential revenue to this tax break—that’s almost 25 percent of its total tax revenue! Governor Branstad himself made out quite well under this tax break. In 2011, he paid just $52 in state income taxes because he was able to deduct his 2010 federal taxes from his 2011 state income tax bill. 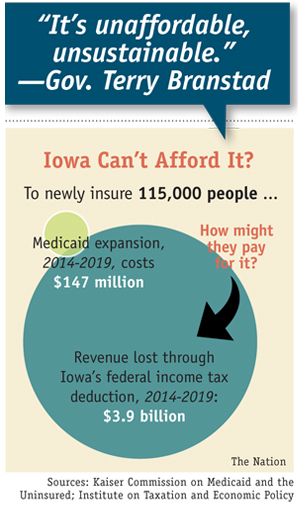 What would expanding Medicaid to insure 115,000 residents cost Iowa between 2014 and 2019? Just $147 million. If folks like Governor Branstad paid their fair share of state income taxes, Iowa would raise almost $3.9 billion in those years. Or in other words, it could pay for the expansion more than twenty-six times over. In Louisiana, Governor Bobby Jindal has said the state can’t “afford another entitlement program.” But his state also allows residents to deduct 100 percent of their federal income tax payments from their state taxes. If it didn’t, it would raise $642 million a year—or $3.9 billion over six years. 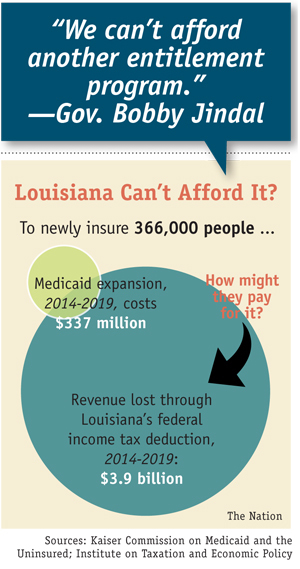 By getting rid of this tax break for the rich, Louisiana could newly insure 366,000 people by 2019, at a cost of just $337 million to the state, more than eleven times over. Florida is home to 3.8 million uninsured residents, about 21 percent of its population, the third highest rate in the country. Expanding Medicaid would bring coverage to at least 942,000 of those folks at a cost of $1.2 billion between 2014 and 2019. It’s also home to one of the country’s most infuriating tax loopholes—the infamous “Rent-a-Cow” tax loophole—which allows developers to claim agricultural tax breaks by letting ranchers keep some cattle on industrial or commercial land. In 2006, the Associated Press estimated that this loophole costs the state $950 million a year. Granted, some of that goes to legitimate farms, but as the Miami Herald noted in a 2005 report, most of the top beneficiaries were not growing oranges (or any other kind of fruit). 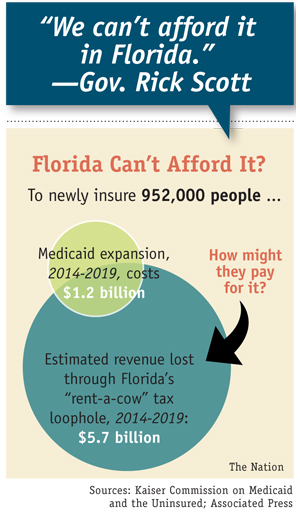 By eliminating this agricultural tax break, Florida could raise at least $5.7 billion between 2014 and 2019, paying for its share of the Medicaid expansion almost 5 times over. Nearby, the office of Governor Phil Bryant claims, “Mississippi cannot afford a Medicaid expansion.” But Mississippi and Pennsylvania are the only states that have state income taxes to refuse to tax retirement income at all. In 2011, the state’s annual tax expenditure report concluded that it would miss out in more than $341 million in potential revenue in 2012 as a result. By taxing retirement income, it stands to generate at least $2 billion in the first six years of the Medicaid expansion. That would pay its share ($429 million) more than four times over. From the very first salvo in the debate over healthcare reform, Republicans have cloaked their opposition to expanding coverage by resorting to fear-mongering and lies. Remember Sarah Palin’s “death panels”? That was rated PolitiFact’s 2009 “Lie of the Year.” Or how about the idea that the ACA amounts to a “government takeover” of healthcare? That garnered the PolitiFact honor one year later. An equally powerful lie has been the notion that the ACA is just too expensive. Rush Limbaugh wildly asserts that the ACA is the “largest tax increase in the history of the world” (not true by a long shot, points out MoJo’s Kevin Drum). And Mitt Romney claims that “Obamacare adds trillions to our deficits.” In fact, when the CBO scored the bill in 2010, it concluded that the law would reduce the deficit by $124 billion over ten years. Hysterically exaggerating the cost of healthcare reform is one tactic, but presenting those costs in isolation is another—and perhaps more insidious—tactic. As these charts illustrate, austerity itself is a lie. We are not broke. We can pay for healthcare reform—and for teachers, police, firefighters, welfare, food stamps and any number of social services—if we go to where the money is. What the false debate over the cost of Medicaid expansion obscures then is the real choice the GOP refusniks are making—to insure millions of Americans or to preserve tax cuts for the wealthy and cheer while those around us just die. Additional research and reporting by Gizelle Lugo.